Synopsis: A retelling of the story of the world’s most famous monster. As an accident at a Japanese power plant leads to the discovery that mankind has been hiding some rather large secrets that represent a huge threat to humanity. Review: When looking at the various incarnations of huge monsters that are ingrained in popular culture, Godzilla is for many people, one of the biggest and best that has ever been brought to the big screen. Ever since the original 1954 creature stomped into existence, we have seen cities get destroyed by large monsters right throught cinematic history. Godzilla has gone through several incarnations since and with the disappointment of the 1998 version, director Gareth Edwards would have probably felt the pressure to deliver the Godzilla movie that the fans want to see. In this respect, the director of Monsters has hit the mark as we have a new version of the iconic monster that seems like it is hoping to be a throwback to the 1954 film, and bring a very realistic take on the King of the Monsters. A version that should atone from the horrors of the 1998 incarnation of the legendary character. At the same time, the focus of the film is largely on the humans. The focus is what would be the consequences if a giant monster rose out of the ocean and threatened our very existence. It is a battle to stop these monsters from destroying everything the human race has ever known. As the film’s focus is on the human struggle, we have our lead characters Ford Brody (Taylor-Johnson)with his wife Elle (Olsen) and Ford’s father Joe (Cranston). The latter of which is convinced that humanity is holding some gargantuan secrets. Although he is not in the film a lot, when he is on screen, the Breaking Bad star is on superb form. He is a scene stealer, in particular with one of the very first scenes in the film, his emotion really shines through. While, his son Ford was almost emotionless and stoic at times. While the Ford family look for the answers to their past. In another corner, we have an alliance of scientists and military, led by Ken Watanbe and David Straitharn, working together in order to try and understand the rather large problem and the best way to deal with it. Overall the human cast, without doubt, a talented group of actors, do a great job in portraying the horrific problem that has arisen. 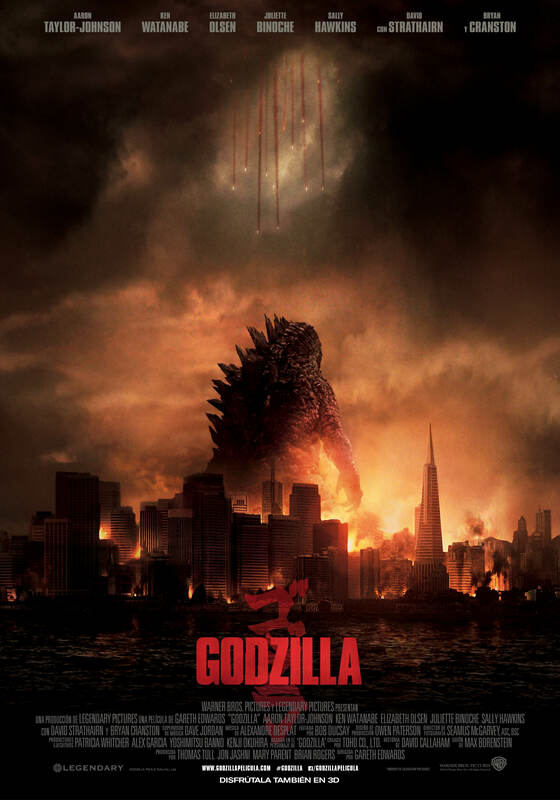 With the focus being on the humans, Godzilla does not have a large amount of screen time in the film, and in that respect, some may walk away disappointed. However when he is on the screen, it is fantastic to watch. Edwards and his team certainly intended to create their version one that honoured the original. The battle scenes with Godzilla are enthralling to watch and on several occasions there is the iconic Godzilla roar. These titanic duels are going down and buildings are being reduced to rubble. This new incarnation of the legendary Toho monster, truly is something to behold. There are plenty of other enthralling action scenes to get the heart pumping. That being said, with some scenes, it is set to show a clash of monsters that we paid to see. Instead it montages through the action, which may leave the audience somewhat disappointed. It would not be unreasonable to see lots of scenes with Godzilla battling and seeing cities get torn apart, but these are rare in number. Despite the lack of screen time that Godzilla has, Gareth Edwards made a solid film that does give the iconic character the film that it deserves. The camera work and directing, are both excellent. Equally as epic, is the score by Alexandre Desplat. The visual look of Godzilla is also superb and while the fight scenes you really wanted to see are few and far between, it is a strong, realistic take on what would happen from the perspective of mankind, if monsters suddenly rose out of the ocean and began to destroy humanity. While there’s not as much Godzilla screen time as you might expect, with strong human characters and some fantastic action scenes, there is enough in this take on the King of the Monsters that should leave viewers roaring with delight.